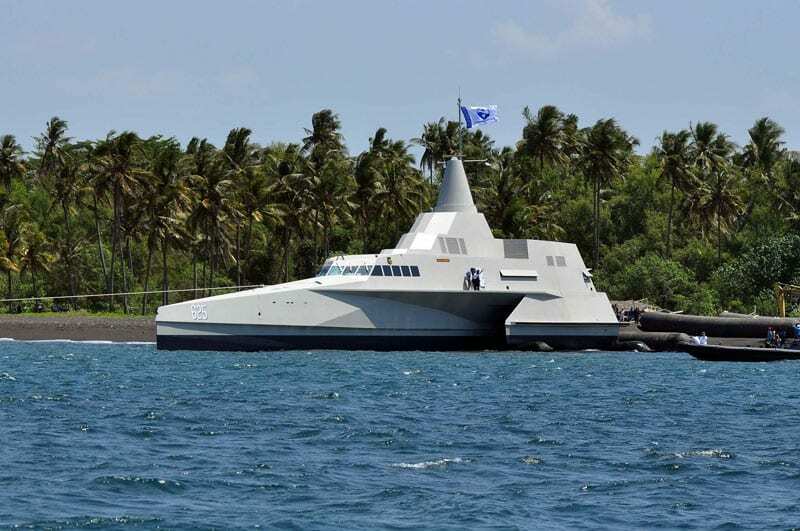 Indonesia’s North Sea Boats (also known as PT Lundin Industry Invest) launched the first of four new Klewang-class trimaran missile boats for the Indonesian Navy (TNI AL) on Aug. 31, 2012 at its Banyuwangi facility. The 63-meter long, wave piercing trimaran, also known as the X3K, is built of composites using infused vinylester carbon fiber-cored sandwich materials for light weight, strength, and good corrosion resistance, as well as low-observability from reduced signatures. It also has an integrated mast system. 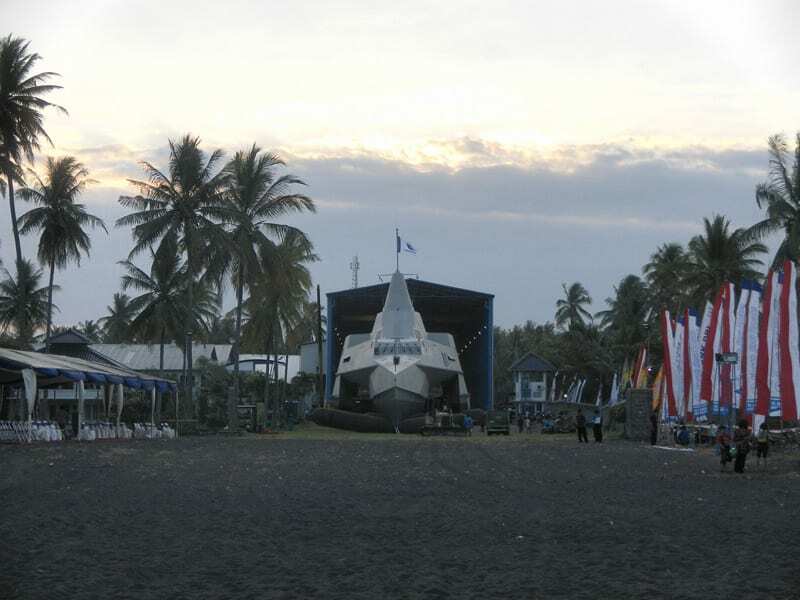 The trimaran project started about 5 years ago, according to John Lundin, CEO of North Sea Boats. Lundin, who comes from a family of shipbuilders in Sweden, moved to Indonesia several years ago to set up businesses including North Sea Boats, which was started in 2003. The Klewang-class trimaran was designed in partnership with New Zealand based naval architects LOMOcean Design Ltd. over a period of 24 months. The X3K concept draws from the LOMOcean Design’s 24-meter Earthrace (later Ady Gil), holder of the record for the fastest circumnavigation of the globe by a power boat. Construction of the Klewang took about two-and-a-half years. The X3K has been designed to Germanischer Lloyd structural design rules. In particular, the structural design and approval methodologies were tailored specifically for the unusual geometry of a large, wave-piercing trimaran. The ship has been designed to operate in sea states with 6-meter high waves. What is remarkable about this project is that this is the first time such an advanced ship has been produced in a developing country. North Sea Boats says the use of carbon foam sandwich composites on this scale in naval application is “unprecedented” outside of Scandinavia and is representative of the current state of the art in both maritime composites structural engineering and production technology. A large portion of the materials were supplied by Gurit, through their marine division in New Zealand, SP – High Modulus. While some of the Gurit core came from China, the carbon material was sourced from various countries. Not having a highly skilled local labor force, NSB adopted the design and production technology to match locally available labor skill levels. For instance, the ship uses a large number of flat panels and high volume vacuum infusion systems and CNC milling to mitigate risks and ensure requisite production quality and repeatability. Klewang has an overall length of 63 meters, a waterline length of 61 meters, a beam of 16 meters, and a draft of 1.2 meters at a displacement of 219 tonnes. CGI of the X3K showing the ramp for launching and recovering the 11-meter RHIB. The missiles will be housed in the uppermost box-like section of the aft superstructure. A CIWS and a fire control director are also seen. The ship is powered by four MJP 550 waterjets – two located on the outriggers and two on the center hull – driven by four MAN V12 engines rated at 1800 horsepower each. Top speed is as much as 35 knots, although cruising speed is 22 knots. Range is in excess of 2000 nautical miles at 16 knots. Internally, the ship has three decks. Accommodation is provided for up to twenty-nine, including a special forces team that can deploy using a ramp-launched 11-meter X2K high speed RHIB capable of 50 knots. It is widely speculated that at least four and possibly eight C-705 anti- ship missiles with a range of 120 kilometers will be fitted in enclosed launchers on the superstructure. Available graphics show a superstructure-mounted director and a small caliber CIWS in a stealthy turret similar to weapons fitted on China’s Type 022 missile catamarans. 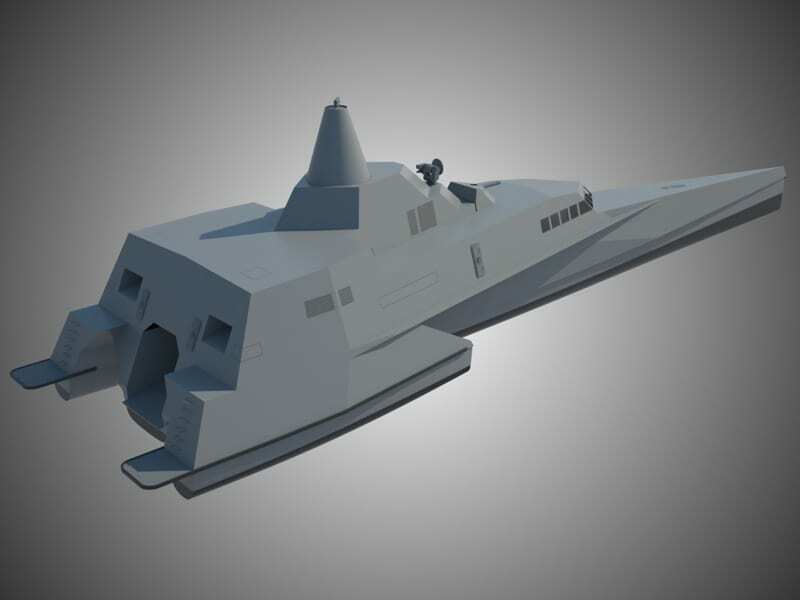 NSB adds that other antiship weapons such as Penguin, Exocet and larger caliber guns up to 57 mm can be mounted on the superstructure without affecting stability. Klewang will undergo additional outfitting for the next four weeks, after which extensive sea trials and tests will commence in October. Final operational clearance is expected sometime in 2013. NSB is under contract to deliver four of these trimarans by 2014. However, NSB officials declined to comment on the status of the other three ships. Indonesian media report that each ship costs about Rp 114 billion ($12.5 million), although this is very likely the cost of the ship less combat systems. NSB won’t comment on this either. According to TNI AL Admiral Sayid Anwar, the Klewang, which is to be based in Surabaya with the service’s Eastern Fleet, is the first large composite warship in the Indonesian Navy. Along with the Klewang-class trimarans, Indonesia is also pursuing several indigenous programs for a series of 40-meter and 60-meter fast missile boats known locally as kapal cepat rudal (KCR). PT Palindo has delivered two Clurit-class KCR 40 missile boats, and is constructing one if not two more. PT PAL in Surabaya has an order for three larger 60-meter KCR 60-class missile boats. However, being that the project is still at a design stage, PT PAL has not yet announced delivery dates. These programs are part of Indonesia’s strategic drive to build up a minimum essential force structure for its armed forces by 2024 while simultaneously developing and growing the country’s indigenous defense industry. I hope the next Indo can more product other warship to protect Indo large sea.